A trip through southern and eastern Iowa took me through the small town of Columbus Junction which of home to a roadhouse in the tradition of the greatest of Patrick Swayze movies. Location: 808 Oak St. on Rte. 92 in Columbus Junction (population 1,900) in Louisa County in Southeastern Iowa. Directions: Drive through town on Rte. 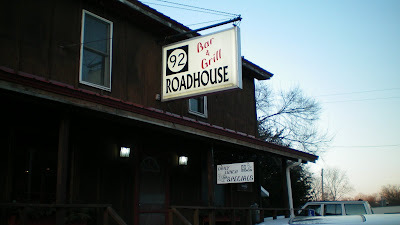 92, this place is just west of town on the north side of the road. 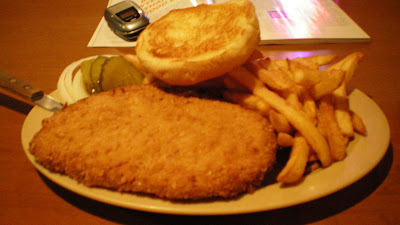 The Tenderloin: Homemade Fried Tenderloin is what the menu reads. This began as a slightly larger than usual cut of pork loin. It was pounded into a thin, but not too thin, width. Most but not all fat was trimmed off before breading. 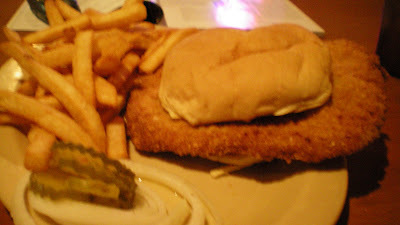 The meat was tender and moist but it was the breading that turned me off. It was crisp and crumbly but also very stiff upon biting. It formed too much of a layer over the meat. I think this may have been in the fryer too long. The edges were clearly more brown than the rest. 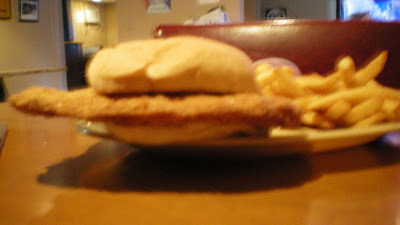 The tough breading seemed to hold up the sandwich, the areas outside the bun did not wave or curl but stuck straight out. Not exactly worth travelling for. Served with the fixings on a toasted bun. 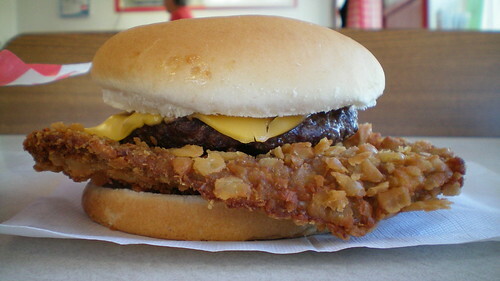 Overall 6/10 Price: $5.55 with chips, fried extra. Also available grilled. Tasty beer-battered fries with extra charge. Also on the Menu: Roadhouse grub like steak, hamburgers, and fried chicken. Service: I was here during a dead part of the day, only a bartender was here in the bar area. He was having a loud conversation over the noise of the TV. Pulling double-duty as drink-pourer and cook may have been too much. As I was leaving, a waitress showed up to take my bill. Ambiance: Real roadhouse atmosphere is found in abundance right here. There a unfinished walls and few windows to allow in natural light. A television plays sports news at a very loud volume. The lack of light meant all of my pictures turned out lousy. The bar area is being remodeled when I visited. Final Thoughts: I think I may have come at the wrong time while the bartender/cook was busy. Seconds count when you are frying these things, and I think a slight overcooking may have taken the tenderloin down a notch or two on the T-Scale.